Announcement Welcome to Bohemian Design Studio. We are based in Surrey, UK. Here you will find a collection of unique handmade charm jewellery - necklaces, bracelets, earrings and clip-on charms. All pieces are handmade with love and care by Winnie, in a pet-free, smoke-free home. *1 to 2 working days from date of shipping for within the UK (1st class standard). If you require tracking, please let me know so I can arrange. *7-10 working days from date of shipping for international destinations. It can take up to 20 working days due to delay in mail service or through customs. Between 29 Nov and 31 Dec 2016, international shipping is by tracked and signed (£9) - so a tracking number is available for you to track the parcel in case of delay in the busy festive season. PLEASE understand I will ship your item out in its dispatch time, BUT it is down to the mail service to deliver your items on time. Hope you will find something that you like. All items in my shop include a complimentary organza pouch bag or gift box. Welcome to Bohemian Design Studio. We are based in Surrey, UK. Here you will find a collection of unique handmade charm jewellery - necklaces, bracelets, earrings and clip-on charms. All pieces are handmade with love and care by Winnie, in a pet-free, smoke-free home. I liked this little charm, delivered quickly, no problems. I was happy with this little charms. Received quickly with no problems. Such a lovely keyring! I bought this as a present for my PT and he loved it. It arrived quickly and is great quality! Bought this as a gift for a PT friend - he loved it! Lovely mother daughter keyrings gift set personalised initial letter charms. Wonderful Christmas present. Brand new ‘best friends’ fitness keyrings with trainer charms. Perfect Christmas gift for running buddies. 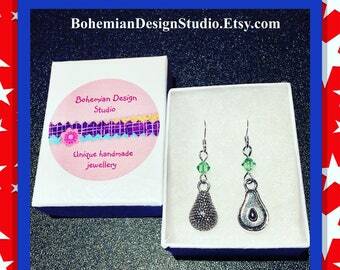 Welcome to BohemianDesignStudio.Etsy.com and thank you for visiting! We are based in Surrey, UK. Here you will find a collection of unique handmade jewellery - necklaces, bracelets, earrings and clip-on charms. All pieces are handmade with love and care by Winnie, in a pet-free, smoke-free home. You will find many unique and exciting handmade pieces in our shop. Please take a moment to browse our collection. In the meantime, if you have any questions on the items, please feel free to contact us. Refund can only be made when an incorrect item was sent or that the item was faulty. In this unlikely event, please contact me within 3 days on receipt for a refund/exchange. Unfortunately, shipping costs will not be refunded. Due to health and hygiene reasons, we are unable to refund or exchange earrings. We accept payments through PayPal, credit/debit cards and Etsy gift card. By default, 1-2 working days. Up to 7 working days for custom items as stated in the listings. PLEASE understand I will ship your order after it's been processed (see time above), BUT it is down to the mail service to deliver your items on time. Delivery is by Royal Mail Service from the UK. Proof of postage is obtained for all orders. 1 to 2 working days from the date of shipping by 1st class standard post. Our standard shipping is not tracked. Please contact me if tracking is required. Around 10 working days from the date of shipping. It can take up to 20 working days due to delay in mail service or through customs. Please allow 28 days from the day of dispatch for delivery of your order. Buyers will not be entitled to a refund or a replacement until after 28 business days has passed. This is because Royal Mail service would only consider a package to be missing after 28 days and cover the cost of the content/postage. If you have any queries regarding our items or policy, please do not hesitate to message me.